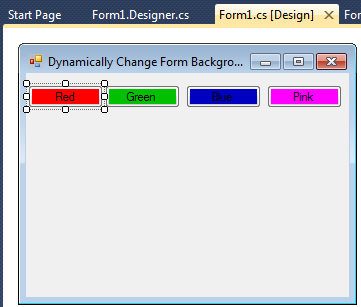 This article will show you how you can dynamically change form background color on button clink using c#.net in windows application. In this I have used windows form button control and c# to write code. Some of my previous articles are as follows: Dynamically Add Textbox Control in Panel and Clear All on Single Click Using C#.Net in Windows Application, Confirmation Message on Button Click and Capture YES/NO Click by User in Windows application, C#, Error Handling in Windows Application Using C#.Net, Restrict User to Enter Only Negative, Non-Negative and Decimal Number in TextBox Using C#.Net in Windows Application, Dynamically Add textbox control on button click in windows application using C#.net and VB.net, Paging in DataGridview Using C#.Net In Windows Application, Show Progressbar While Moving Folder File From One Directory To Other Using C#.Net In Windows Application. So for this article first we will create a new windows application and add button controls to generate click event. You’re for design will be as shown below. Now add the below code on button click event. Please check the above code. In above code I have assign the backcolor property with a color. So we have done have a look for the output.